Berry Bros & Rudd is a family owned private wine company with the eighth generation now working in the business. 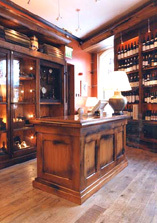 Founded in 1698, Berry Bros. & Rudd opened its Dublin wine shop in 1999. 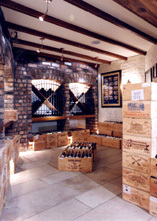 Located in the former Weights and Measures Office, built in 1880, it has been fully restored and now houses over 800 wines within its historic walls. Berry Bros & Rudd is a British company with outlets around the world including London, Hong Kong, Heathrow and Basingstoke. Only one of these elaborate wine shops can be found in Ireland. Situated at at 4 Harry Street, a stone's throw from Grafton Street and across the road from the Westbury Hotel, the shop offers a comprehensive selection of over 800 wines. A fascinating display in the shop of some of the original Standard Weights & Measures, on loan from Dublin Civic Museum, is reminiscent of the giant scales which dominate Berry’s original store in St. James's Street, London. Beneath the shop atmospheric cellars contain an unbeatable selection of fine and rare wines. On the first floor the offices of this historic institution have been converted into an elegant dining room and wine tasting area.